"Our ordinary sorrel, which grows in gardens, and also wild in the fields, is so well known that it needs no description," wrote 17th -century English physician Nicholas Culpeper in his seminal "Complete Herbal." For many modern cooks, sorrel does need an introduction. It doesn't take well to industrial farming, so it's something you'll never find in your local supermarket. However, heightened interest in all that's heirloom means you might soon find sorrel for sale at the farmers' market or in your community-supported agriculture program . Like tarragon, sorrel is a flavor favored by the French. You'll find it in traditional cream sauces and a classic dish such as soupe aux herbes (soup with herbs). In the 1980s, sorrel experienced something of a renaissance with the Troisgros brothers, architects of nouvelle cuisine, because its clean flavor worked well in light sauces paired with rich fish like salmon. Sorrel is also the main ingredient in shav , an Eastern European soup typically served chilled. Think vichyssoise with a bite. "I almost feel better after eating it," says Ben Hasty, executive chef of the Dunaway Restaurant at Strawbery Banke in Portsmouth, N.H., "The flavor is almost like lemon rind, only more delicate. It can be overpowered very easily, which is why it's best to keep it simple." He advises sorrel novices to tear up its tender leaves into mixed lettuces, or create a chiffonade garnish for chicken or fish. You could even substitute sorrel for basil in a pesto. Sorrel quickly turns an unattractive muddy green when aggressively heated. To preserve its brilliant emerald color in sauces, Hasty runs bunches of the herb through a juicer, then stirs the resulting elixir into a gently simmering cream sauce. Similar results can be achieved at home by blending raw sorrel leaves into a soup or a sauce moments before serving. Hasty makes a sorrel cream with pan-roasted Scottish salmon, and a Yukon potato gratin. 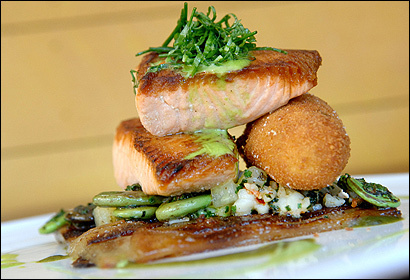 "The tart sorrel sauce reacts so well with the salmon, which is so rich and buttery," he says. "You really don't need a lot of extras."